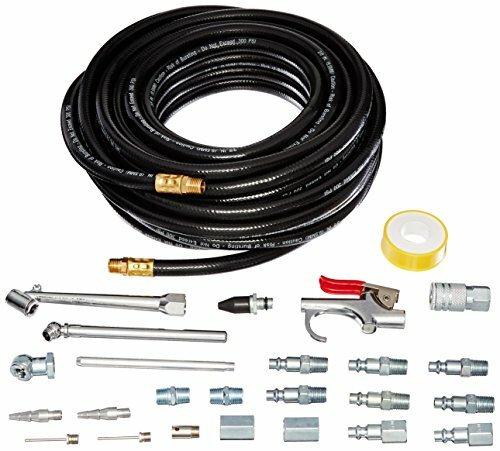 The Primefit IK2004-2 is a combination package that includes Primefit PVC380503 a 50-Foot 3/8-inch PVC Air Hose and Primefit IK1010S-25 which is a 25-Piece Air Accessory Kit and Storage Case. The Primefit PVC380503 50-Foot PVC Air Hose provides lightweight handling and real durability for use on the job site. This heavy-duty hose is resistant to oil and abrasions and has a max pressure of 300-PSI and ¼-inch NPT hose ends. This heavy-duty reinforced PVC hose is constructed for long life and durability. The Primefit IK1010S-25 is a 25-piece kit that has all of the accessory items all packed in a durable clear storage case for easy access and organization. Included in the kit are all of the essential items, a blow gun with (5) different nozzle attachments, (2) quick connect couplers, (11) quick connect plugs for a variety of tools, a dual air chuck and ball foot chuck for tire inflation, a tire gauge, (2) sport ball inflation needles, PTFE sealant tape, and a variety of air hose connection fittings. Primefit IK2004-2 50-Foot PVC Air Hose with 25-Piece Air Accessory Kit and Storage Case comes with a limited 1-year warranty. From do-it-yourself, to professional, to industrial applications, Primefit delivers. Primefit has been manufacturing Pneumatic Accessories, Air Tools and Compressors for over 30 years. View More In Hydraulics, Pneumatics & Plumbing. If you have any questions about this product by Primefit, contact us by completing and submitting the form below. If you are looking for a specif part number, please include it with your message.